JAKARTA, August 28, 2018 – President of the International Sports Press Association, Gianni Merlo has described the ongoing Asian Games in Indonesia as “special”, adding that it has provided a perfect platform for a potential award-winning journalistic content. Submissions are still open for the maiden edition of the AIPS Sport Media Awards with the deadline set for September 17 - a mere 19 days away. Submissions are absolutely free and can be done in any language via www.aipsawards.com. Asian Games Speaking in a recent interview conducted in Jakarta, where the promotion of the Awards is in full swing, Merlo reiterated the importance of recognising sport media excellence across all media platforms, while also hoping that the Asian Games will inspire a lot of entries from Asia. “I think that the AIPS Awards are very important and Asia is very important for us as well. We already have a lot of submissions from Asia, but more has to come because these games are special and many of our colleagues have waited for this occasion to produce the best photos, videos and also articles. Awards promotion Since the AIPS Sport Media Awards was launched in February at the Pyeongchang Winter Olympics “the imaginary flame of Sport Media Excellence” has travelled across the five continents of the world, making notable stops in the major sporting events of the year. In its first month of being online, the AIPS Sport Media Awards website (www.aipsawards.com), which started functioning in April, received visits from over 100 countries and its reach has continued to spread from there. Merlo has so far been impressed with the promotion of the awards. “It is promoted by all the national associations and by a lot of young reporters,” he said. 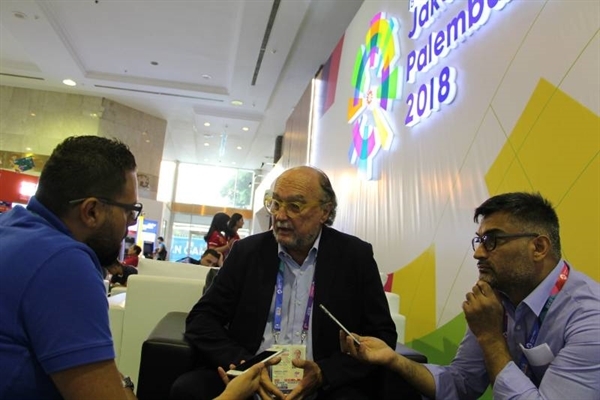 No language barrier During the interview in Jakarta, the AIPS president also made it clear that submissions for the AIPS Sport Media Awards can be made in any language. The rules have also been translated into five different languages, Arabic, French, Spanish, Russian and Italian. Jury Following the deadline for submissions on September 17, Merlo has revealed that the jury will have their first meeting “in the beginning of November” to deliberate on nominations put forward by the AIPS Executive Committee. The AIPS Executive Committee is charged with shortlisting ten potential candidates for each Award category for consideration by the Jury. The Jury will then select three finalists who will be invited to the final Awards ceremony in January 2019 in Lausanne, Switzerland. Ceremony According to the AIPS president, plans are going on very well for the final Awards ceremony.